The Netherlands is the best country of the world, after Switzerland, according to FD journalist Matthijs Bouman. He states that, regarding competition and innovation, there are only three countries better than The Netherlands. Add the factors around happiness of the citizens to that and the only competitors left are the Swiss. One of the key drivers for this success is the favorable innovation climate in The Netherlands, which has remarkably increased in attractiveness over the past years. We are Europe’s number one on the Startup Nation Scoreboard and Amsterdam is known as the Capital of Innovation of Europe, as well as the highest newcomer in the top 20 of the Global Startup Ecosystem Ranking. Additionally, The Netherlands has risen from the tenth (in 2011) to the fifth spot in the Global Competitiveness Report and the Global Innovation Index has rewarded us with the fourth place. And so there are endless lists showing that “we” are completely back in the game and are again a force to be reckoned, compared to a few years ago. There are obvious signs that, although our country is small, we play in the major league for Innovation & Entrepreneurship. Because of the exceptionally strong foundation for innovation from which The Netherlands can facilitate the success of thousands of start-ups. Initiatives such as the football playing robots from Tech United of TU Eindhoven (photo), who won the WC Robot football in 2014 and 2016, and the smart robots from Delft University & RoboValley who won the Amazon Picking Challenge in Leipzig are proof of the exceptional talent and facilities around our Universities. Where are the KLM’s, Unilevers and Heinekens? However – we lack track record in scaling up the high potential start-ups. In the past The Netherlands has proven to be able to be very successful in scaling – think of KLM, Unilever, Heineken, Shell, Ahold, Akzo Nobel. These are all names of leading companies that have made the transition from start-up to scale-up and are still part of the global leading companies. Their success provides them an outstanding position in the world economy and gives them access to consumers, goods and global brand awareness. Many things are well arranged in The Netherlands. Compared to the rest of Europe we have the lowest business expensesfor start-ups. Moreover, the average knowledge and education level is high. According to the top 200 of best European universities, the average score of Dutch universities is the best of Europe. 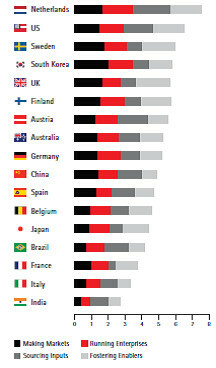 In this eMarketer article about the amount of users of social media, The Netherlands ranks highest. With a “user penetration” of 72.3% we are three percentage points ahead of the Norwegians. And in the Digital Density Index we also rank first. For this worldwide research it has been analyzed which foundations a Digital Economy requires to facilitate an accelerated growth – with The Netherlands as leader and example for other countries in this report. The Digital Density Index (DDI) measures the digital economic productivity of countries around the world and is based on more than fifty indicators spread over four terrains. As far as countries’ economic performances are concerned, the higher the score, the better the assimilation of digital technology. Therefore, as their skillset increases, they will increase their economic potential. Now bring in that championship! The conditions are there. The Netherlands has proven time and again that we be a world market leader. The government is working hard to create a favorable climate that allows breakthroughs to be realized. Now we need to accelerate to beat the Swiss and take their first place – and become the real World Champion of Innovation. Our ecosystem of start-ups and scale-ups is much more powerful than the one of the Swiss. 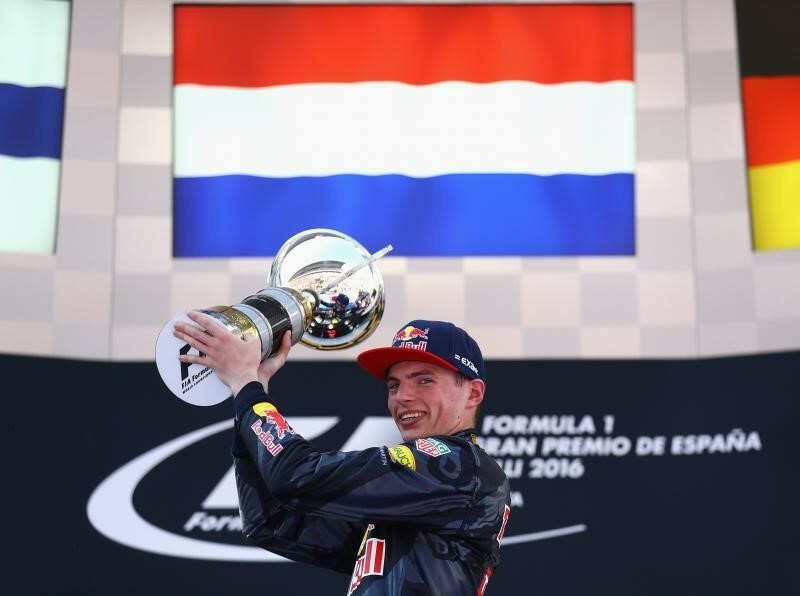 If we can manage to accelerate in that area, then we will shoot past Swiss like Max Verstappen past Daniil Kvyat. Build Bridges between start-ups and corporates to realize the right partnerships. The creativity and innovation power of start-ups combined with the execution power and worldwide market access of corporates creates mutual value. We are committed to help these collaborations flourish by providing services like Innovation Scouting and then building the bridges between start-ups and corporate EG by rapid development of joint prototypes. For this we combine the power of our global open innovation network with our innovation database based on 10 years of Innovation Awards research. Dutch start-ups: think bigger! Take the initiative to also seek individually for ways to realize a big breakthrough. Do not settle for the ‘success’ of being taken over by a big (American) company. Aim to be the big fish yourself. Dutch Government – increase your support for entrepreneurship. Regulations and slow decision-making are key risks for scale-ups. If you can intensify and connect initiatives such as Startup Delta, Startup Amsterdam and the worldwide Innovation Attaché Network - to name but a few – this will make a huge impact. Connecting start-ups, corporates, research institutes, universities, venture capital and the government we can build a bridge between innovation and execution. Or in other words: bring start-ups to scale-ups. Let me know if and how you would like to get involved. Together, we can win big. If we can realize this impact together, then we can raise our glasses to celebrate our championship soon.